damage. It also brightens your skin to produce a natural glow. Let's Face It Skin Essentials diminishes the appearance of age spots; it’s anti-inflammatory properties decrease puffiness and reduces the appearance of dark circles and puffiness around your eyes which makes you look rested and fresh. This anti-aging moisturizer contains matrixyl, a patented pentapeptide which repairs damaged skin, Palmitoyl tetrapeptide-7 which help tighten skin, green tea extract a potent anti-oxidant, witch hazel extract which contributes to reducing swelling, and glycerin which prevents dry, scaly skin. Let's Face It Skin Essentials have non-comedogenic properties are great even for the most sensitive skin. It has a creamy formula, even with small amount of application, goes a long way. Let's Face It Skin Essentials is a non-irritating skin rejuvenation day and cream that you can use for all skin types. As we get older, our skin becomes less firm, prone to damage and loses its natural elasticity resulting in fine lines and wrinkles. 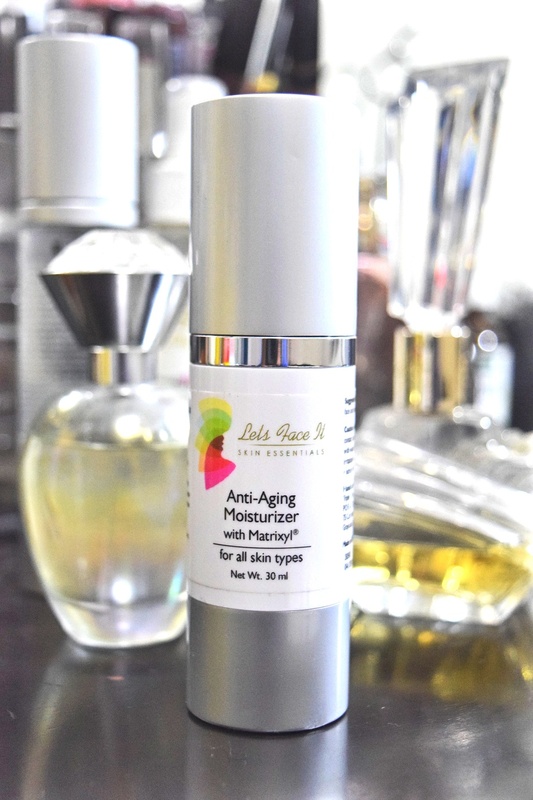 This anti-aging moisturizer is packed with scientifically proven key ingredients which permanently diminish deep lines and wrinkles, stretch marks, skin imperfections and balancing your skin’s pH to achieve a brighter, younger looking skin. 1. Matrixyl: This is a patented Pentapeptide that specifically targets and stimulate collagen synthesis and repair damage, stimulating the lower layers of the skin. 2. Palmitoyl Tetrapepetide-7: This is an FDA approved ingredient which reduces skin inflammation and the accompanying skin damage. This ingredient also stimulates the regeneration of collagen fibers in the dermis by acting as sort of cellular messengers and helps tighten skin. 3. Green Tea Extract: It contains a high amount of antioxidant which improves your skin complexion and makes your skin healthy. It delays signs of skin aging such as sagging skin, sun damage, age spots, fine lines, dark circles, and wrinkles. They help shrink blood vessels underneath the delicate skin around the eyes. 4. Witch Hazel: Witch Hazel contains a chemical called tannins which contribute to reducing swelling, repair broken skin, and tighten skin, and fight bacteria all at the same time. 5. Glycerin: Glycerin helps and prevents dry, rough, scaly, itchy skin, and minor skin irritations for silky smooth skin. When you use Let's Face It Skin Essentials, you will notice a significant decrease in the depth and size of your wrinkles, fine lines, age spots and other skin imperfections. With daily application, your skin will start looking incredibly younger, smoother and wrinkle-free. This moisturizer is hydrating and absorbs quickly with deep level hydration the entire day, leaving the skin with soft, smooth, silky feel and supple. This post is in collaboration with Let's Face It Skin Essentials, all thoughts and opinions are my own.